Inquiring minds may wish to slog through today's FOMC Press Release on Monetary Policy but it's really not worth the time it takes to read it. The Committee judges that there has been a substantial improvement in the outlook for the labor market since the inception of its current asset purchase program. The Committee today reaffirmed its view that the current 0 to 1/4 percent target range for the federal funds rate remains appropriate. If incoming information indicates faster progress toward the Committee's employment and inflation objectives than the Committee now expects, then increases in the target range for the federal funds rate are likely to occur sooner than currently anticipated. Conversely, if progress proves slower than expected, then increases in the target range are likely to occur later than currently anticipated. The Fed also released a Statement Regarding Purchases of Treasury Securities and Agency Mortgage-Backed Securities. NEW YORK — On October 29, 2014, the Federal Open Market Committee (FOMC) directed the Open Market Trading Desk (the Desk) at the Federal Reserve Bank of New York to conclude the current asset purchase program by the end of October . The FOMC also directed the Desk to maintain the existing policy of reinvesting principal payments from the Federal Reserve’s holdings of agency debt and agency MBS in agency MBS and of rolling over maturing Treasury securities at auction. This policy, by keeping the Committee’s holdings of longer-term securities at sizable levels, should help maintain accommodative financial conditions. Reinvestments in agency MBS will continue to be concentrated in newly-issued agency MBS in the To-Be-Announced (TBA) market. The Desk will adjust the number of individual agency MBS operations per month as needed for operational efficiency. The distribution of agency MBS purchases could change if market conditions warrant. 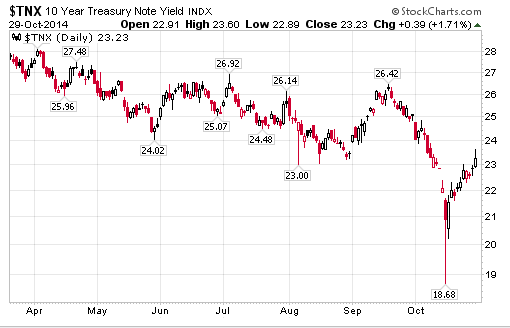 Curve Watchers Anonymous points out the yield on 10-year treasuries barely budged today as shown in this chart of $TNX. The 10-year treasury yield is up slightly today to 2.32% a rise of about 4 basis points. Yield is down about 20 basis points since the end of September.. In spite of a bit of rah-rah about jobs, the Fed practically committed to holding rates low indefinitely. Here is the key statement: "The Committee currently anticipates that, even after employment and inflation are near mandate-consistent levels, economic conditions may, for some time, warrant keeping the target federal funds rate below levels the Committee views as normal in the longer run. " In addition, the Fed will continue to reinvest proceeds from treasuries and agencies in a manner "to be announced". Hikes? Forget about them. They are not coming. I inadvertently posted a chart of TLT (a treasury fund) instead of $TNX, the treasury yield. Text above modified accordingly.